Traka Introduces its Intelligent Access Management Products to American Companies and Industrial Security Professionals at the ASIS International 2011 Convention in Orlando, Florida. Traka’s innovative electronic key access systems drew the attention of top corporate intelligence, security executives, and law enforcement leaders from over 100 countries in attendance at ASIS International 2011—all looking to learn about Traka’s secured access solutions for managing their organization’s valuable assets. And the interest did not stop there, as numerous military/defense officials, government agencies and intelligence experts were impressed with Traka and its products—all of which have been designed to mitigate the risks associated with human interaction with assets such as buildings, equipment, machinery or vehicles. Whether they managed access to weapon systems, aircraft, secure buildings or sensitive computer equipment, Traka had a solution designed to meet their security needs. At a time when America’s national, corporate and industrial security is at its highest level of awareness, Traka has delivered a range of solutions that can minimize the risk and increase the accountability and efficiency of an organization’s asset management. 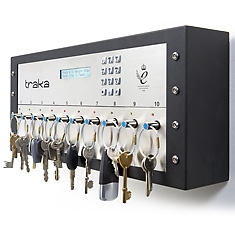 Using Traka’s database-driven intelligent key system, in combination with a range of electronic lockers and bespoke storage arrays, organizations can now effectively monitor and track access to every asset assigned to a key or stored in one of its locker systems. You can learn more about Traka and its products at www.Traka.com/US, or call 1-407-681-4001 to speak to one of our representatives to schedule a demonstration of Traka’s customized access management solutions.